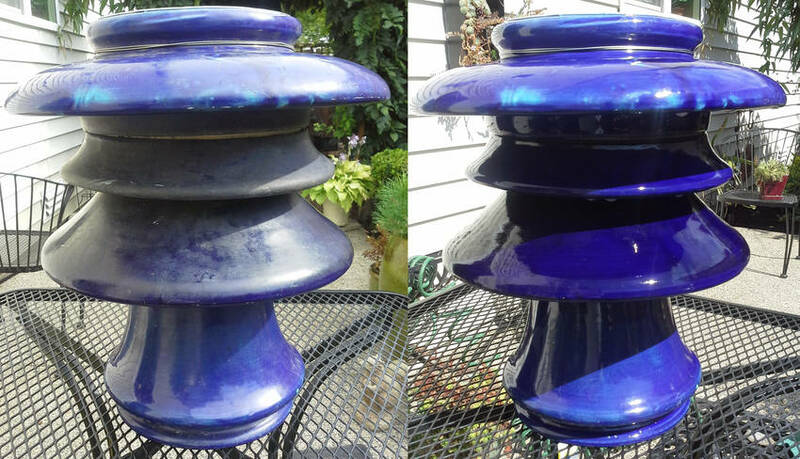 On a Saturday afternoon in August of 2013 I discovered this insulator (an unembossed cobalt blue Pittsburg M-4360) in a Craigslist garage sale ad in Corvallis OR. I dropped everything I was doing (including emptying my car of passengers) and drove 90 miles to a very run down mobile home park where the piece was sitting on a milk crate in the front yard. The owner had been using it upside down for years as a planter for "hens and chicks" succulent plants. The result of this usage was a heavy coating of minerals which were almost sealed to the glaze on virtually all surfaces of the piece. After purchasing the insulator and lovingly driving it home, I tried a number of my recipes for cleaning, most of which would require many hours of hard labor. It was too large to soak so I tried a small bottle of hydrofluoric acid. Taking the usual precautions (used outdoor in a breeze, heavy rubber gloves, eye protection, old clothes, and a charged water hose nearby) I used a toothbrush to apply a very light layer of acid to a section, brushed it lightly for just a few seconds and hosed it off as I went. The outcome was rather astonishing. This photo shows the tops of the skirts before and after the acid and the next photo [id=550065969] shows the undersides. It was the only time I ever used this type of acid but wow, did it ever work!